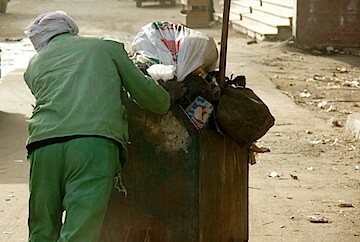 Cairo suburbs are the filthiest, most disgusting areas of any metropolis I have ever visited. Heaps of sewage are piled alongside the irrigation channel, rubbish bags are strewn on the road side, and a scum of plastic bottles floats on the water near the bridges. This guy, therefore, has the most futile job in Cairo.